Thunder Punch is supposed to be an older, grizzled veteran of the battlefield, so hopefully that comes through in my drawing. There's a little bit of action in this one, a bit of a change from my usual static ways. The right leg and foot are awkward, but luckily I had to place some type in there anyways, so I covered that up a little. The colors aren't anything special, and in hindsight, I really meant to make the skin much more tan in contrast to the fair hair. The perspective on the shield is pretty wonky. Overall, this is a piece that I was excited about when it first started coming together, but I'm somewhat disappointed with it as I pick it apart. Oh well... I'm still pretty happy with it as far as the concept goes. Read on! PROFILE: Cynical and world weary, THUNDER PUNCH nonetheless possesses a heart of gold, awakened by the moral purity of his new-found allies. His many years of experience have made him hard edged yet pragmatic. 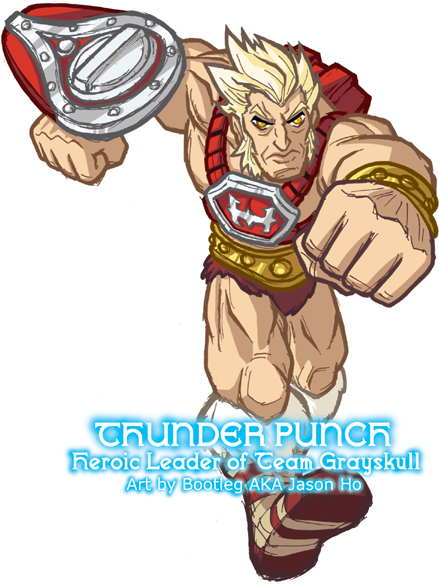 He is a natural leader, though a reluctant one--shortly after Flying Fist joined "Team Grayskull," Teela was forced to leave the group, and she named Thunder Punch the leader, much to his chagrin. His battle harness enhances his strength, speed, and rudimentary psychic abilities. The enhancement allows him to perform maneuvers such as his trademark "Thunder Punch," a devastating attack, enhanced by a burst of chi. His shield further amplifies and refines his psychic power, and recently Thunder Punch has developed a new technique where by concentrating his battle aura upon his shield, he can manifest a psychic power sword. HISTORY: With a heavy heart, King Randor was forced to indefinitely suspend the kingdom's search for the missing He-Man. With the Horde threat becoming increasingly aggressive, Randor simply could not spare any resources towards what seemed to be a hopeless effort. Refusing to relent, Teela resigned her position as Captain of the Royal Guard and exiled herself from Eternos, vowing that she would not return unless she had He-Man with her. Cringer, Orko, and Battle-Scar accompanied her as well. With a heavy heart, Man-At-Arms told his daughter Teela that the kingdom would need him in the war against the Horde and he could not accompany her on her quest. However, he urged Teela seek refuge with the Sorceress, and complete her training in the magical arts. As Man-At-Arms watched his daughter and his closest friends ride away, he said to himself, "If anyone can find He-Man, they can." Teela and her fellowship did take refuge with the Sorceress at Castle Grayskull, and investigated every possible lead over the following months. They found many clues and possibilities, but nothing concrete. In the meantime, the Sorceress continued to guide Teela's education in magic, and Teela's sensitivity to the supernatural developed quickly. A breakthrough came to Teela in the form of a dream-vision, telling her to seek out a warrior; a lost descendant of the legendary King Grayskull, who would aid her in her quest. Teela, Cringer, and Battle-Scar set out to find this lost scion of Grayskull. What they found however, was a grizzled and bitter man living in isolation in the wilderness, a once idealistic knight errant, turned hardened soldier of fortune, who had ultimately decided to reject the world and its corruption in favor of life as a hermit. He knew he was a descendent of Grayskull--he simply did not care. Unable to break through his jaded shell, Teela's group left the hermit in the wilderness. At the edge of the wilderness, they were ambushed by Force Commander Scorpia, Modulok, and a contingent of Modulok's test-tube engineered warriors and monstrosities. Incapacitated by Scorpia's poisonous stinger, Teela was unconscious and capture was imminent. The hermit, who had shadowed Teela's group to ensure that they left his sanctuary, had a split second to make a decision. Before he realized what he was doing, his legs were carrying him into the fray, and with nothing more than a wooden cudgel, he was able to beat back Modulok's creations long enough for Cringer to carry Teela to safety, and for Battle-Scar to regroup with the hermit. The ensuing battle was brutal, but the hermit and Battle-Scar were able to fight off the Horde attackers. Scorpia's poison, however, was spreading fast through Teela's blood. The hermit squeezed his eyes shut, concentrating upon the astral plane, searching for a response... with a flash of light, Battle-Scar, Teela, Cringer, and their new accquaintance found themselves on the Jaw Bridge of Castle Grayskull--Orko flew to them with haste, and treated Teela with a magical antidote. Standing at the gates was the Sorceress herself, holding a red and silver battle harness, and a matching shield. The hermit's expression was impassive, though his eyes betrayed mixed emotions, "It's good to see you, Sorceress." The Sorceress smiled in her usual mysterious manner, holding up the rough implements of war in her elegant hands. "I kept these for you."